Where is the Communism in the Chinese Communist Party? The twelve core socialist values. The few intellectuals who incited the students to action oppose the socialist system and advocate bourgeois liberalization. By that I mean they want China to be totally Westernized and to take the capitalist road. Our experience has shown, however, that we cannot take that road. For 40 years, we have sought truth from facts, advanced with the times, pragmatically yet staunchly followed the guiding position of Marxism, and steadfastly adhered to the basic principles of scientific socialism.... [our course] highlights the irrefutable, scientific basis and fresh vitality of socialism. The great banner of socialism will always fly high in the land of China. In a recent essay for the Texas National Security Review, Liza Tobin wrote a few paragraphs that I found valuable and clever. Tobin's larger topic was the Party term "community of common destiny" (renlei mingyun gongtongti 人类命运共同体). She spends most of her essay exploring the way this term is being used in official Chinese Communist writing. To contextualize the Party's vision for the world she takes a small de-tour to explain how Party leaders understand a word they often use when talking about their vision for this future: democracy. Those who have never been to China may be surprised at how central the word democracy is to the rhetoric of the Chinese Communist Party. Democracy is enshrined as one of the Party's "Twelve Core Socialist Values." 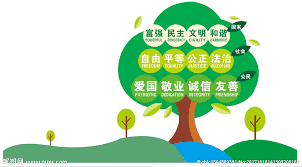 These values are made into gargantuan electronic signs near highways, papered onto hutong walls, and posted in every classroom in the country. Barely a People's Consultative Conference goes by without a thousand Xinhua broadcasts proclaiming the brilliance of Chinese democracy. From Secretary Xi Jinping down to lowly officials at the bottom, you will find Party voices eagerly asserting not only that China is a democracy, but that it is the democracy par excellence. There is a temptation to dismiss this as mere rhetoric: talk of Party democracy is nothing but propaganda for the globe's most gullible. I understand that impulse. A gulf yawns between what we normally associate with the word democracy and the harsh realities of Communist rule. A related temptation is to see the Party's use of the word democracy as a cynical sort of word-game reminiscent of Orwell's 1984 (you will remember the slogan of the ruling party in Orwell's novel: "war is peace, freedom is slavery, and ignorance is strength"). From this perspective, the Party intentionally uses words like democracy in an attempt to distort their meaning and rob them of their power. This is a common authoritarian tactic: forcing the ruled to utter lies as if they were truth has been a part of the tyrant's tool kit for millennia. In the case of the Communist Party of China, I find both of these explanations insufficient. Neither matches up with the way that Party leaders and thinkers actually use this word. I contend that the leaders of the Party take their own rhetoric seriously. They are not cynical—or at least not here. For these leaders, democracy is a real ideal, one they believe is worth striving for. They actually believe that they are democrats. It is just that they conceive of democracy in a very different sense than Americans do. Tobin also recognizes this. Even better, she offers a succinct (four paragraph) summary of what the Party leaders mean when they talk about the need to "democratize" international institutions or the importance of "democracy" to the Party's decision making process. I want to you to go read her entire essay, so I won't quote her explanation here. Just click on this link to go do that as soon as you have finished reading this post. I bring all of this up to introduce a broader point, something I find is often missing from discussions of the intentions and plans of the Communist Party of China. The Party often describes its goals, purpose, and plans with words that for Western listeners occupy a very specific conceptual and semantic space. Often these words are tinged with special moral valence. Democracy is a good example of this. Another example are the words "communist" and "socialist." Those who dislike the Party often emphasize the communist part of the "Communist Party of China." This is good tactics: in the West, communist is a dirty word. Those who feel like tensions between the West and the PRC have risen too high tend to do the opposite. Rhetorically, that means talking about "Chinese leaders" instead of "Communist Party leaders." Analytically, that means arguing that the Communist Party of China is not communist at all. I am sure you have heard these arguments before. The cleverest will say that the 21st century Party has jettisoned its Marxist heritage but maintained its Leninist traditions. More commonly, the doubters of Chinese Marxism will list a set of very un-Marxian attributes of modern China—incredible inequality, the government's divestment from most sectors of the economy, the country's crass consumer culture, or what have you—and then declare these things incompatible with a Marxist system. Marxism is a category modern China just does not fit anymore. If Chinese officials keep on yammering about Marx and Engels, it is mostly to signal loyalty to the regime. In the modern China socialism is a shibboleth, not a living part of its leaders' world view. But what of the capitalist aspects of the Party's regime? How can we take the Party's claims that it leads a Marxist system seriously when it ignores so many of the fundamental tenets of Marxist theory? Let me offer an analogy. But here is the catch: those words were written by a slave-holder. Over the course of their lives, the majority of the men who signed this document owned at least one slave. They would go on to build one of the largest slave-holding republics in world history. Were America's founding fathers phony advocates of natural rights philosophy? Was liberalism a mere shibboleth, a hypocrisy to be spoken but not lived? Were these men truly motivated by words like "equality" or "freedom?" These questions can feel compelling. For many, slavery bars America's founders from the qualifying as true liberals. No one who owned slaves can be classified as a true believer in the phrase "all men are created equal." These men must be placed in a different category. If your goal is make a list of the heroes and villains of human history, this sort of thinking is sufficient. But if you want to understand why American statesmen did what they did, you will find this approach limiting. The question "Do the American founders deserve to be called champions of natural rights philosophy?" is far less interesting and far less informative than asking, "How did the American founders' understanding of natural rights philosophy shape their political decisions?" The the first question can only answer which arbitrary category the founders belong in; the second question's provides a foundation for analyzing the political workings of the early republic. The same logic applies to the current situation. Asking "are the leaders of the Party real socialists?" is not useful. It is far more useful to ask: "What does socialism mean to the leaders of the Party? How do they reconcile communism with the capitalist features of modern China? How do their Marxist beliefs shape the policies and plans of their Party?" These questions are a necessary foundation for any serious analysis of the Communist Party of China. Liza Tobin, "Xi’s Vision for Transforming Global Governance: A Strategic Challenge for Washington and Its Allies," Texas National Security Review Vol 2, Issue 1 (December 2018). An excellent example of this sort of analysis can be found in Samantha Hoffman, "Programming China: the Communist Party’s autonomic approach to managing state security," PhD diss, University of Nottingham (2017). The classic work on the relationship between liberal political thought and the American revolution is Bernard Bailyin, The Ideological Origins of the American Revolution (Cambridge, MA: Harvard University Press, 1967). Thomas West provides an update to this thesis in The Political Theory of the American Founding: Natural Rights, Public Policy, and the Moral Conditions of Freedom (Cambridge: Cambridge University Press, 2017). A picture of a book shelf I own. We often hear of people who will descend to any servility, submit to any insult for the sake of getting themselves or their children into what is euphemistically called good society. Did it ever occur to them that there is a select society of all the centuries to which they and theirs can be admitted for the asking? Razib Khan and Omar Ali, friends of mine who blog at Brown Pundits, invited me onto their podcast this week to talk about Chinese history, literature, and geopolitics. Our discussion was wide ranging. Among other things, we talked about the role that Chinese history plays in modern Chinese rhetoric and pop culture, the "four great novels" of Chinese literature, my extreme skepticism with the claim that there is a "Chinese way of war," common misconceptions about Chinese history, how the growing purchase of Indian, Japanese, and Korean pop culture among the Chinese people might shape Chinese relations with these countries in the future, the vision PRC leaders have articulated for the sort of world order they wish to create, and what "socialism" means to the leadership of the Communist Party of China. Something similar might be said for the great Chinese thinkers. It can be difficult to understand what a 20th century luminary, be they a famous writer like Lu Xun or a revolutionary dictator like Mao Zedong, was getting on about if you don't understand the historical and literary allusions that pepper their works. To understand what people are saying in modern China you need a fairly strong background on what Chinese were saying centuries ago. While I stressed the need to do this on the Browncast, I did not provide a good reading list to help people who wanted to go about actually doing as I advised. This post is an attempt to make up for that oversight. I have divided my list into two parts, each containing nine titles. The first part, which I label "Level One," requires less commitment. Most of its titles are less than 200 pages or are divided up into smaller sections which can be read as stand-alone pieces. Some of the "Level Two" books can be divvied up into smaller pieces, but not all of them can. Several are thousands of pages long. They require a significantly larger time commitment than the "Level One" titles. Before we continue, I should be very clear about what the goal of this list is. My intent is not to provide a birds eye view of Chinese civilization. This list is not about finding macro-historical patterns or the dynamics of East Asia's long duree. If that is what you are interested in, I would recommend starting with Richard von Glahn's The Economic History of China, Li Feng's Early China, Donald Graff's Medieval Chinese Warfare, 300-900 AD (it is really more of a military themed institutional and political history), Robert Mark's China: An Environmental History and the six volumes in Harvard's History of Imperial China series. This list should be considered a humanist's introduction to Chinese history. It is designed to introduce you to the characters, personalities, ideas, books, and events that have shaped "the great conversation" of the Chinese tradition. The hope is that after having read these books you could be given a primary source document from most any period of imperial or modern China and have a good idea of what is being discussed inside it. Dennis Bloodworth and Ching-pei Bloodworth, Chinese Machiavelli: 5,000 Years of Chinese Statecraft, 2nd ed. (Transaction Publishers, 2004). John E. Willis, Mountain of Fame: Portraits in Chinese History (Princeton: Princeton University Press, 1990). Orville Schell, Wealth and Power: China's Long March to the 20th Century (New York: Random House, 2013). Philip Ivanhoe and Bryan van Norden, eds., Readings in Classical Chinese Philosophy (New York: Hackett Publishing, 2005). Philip Ivanhoe, Confucian Moral Self Cultivation, 2nd ed. (New York: Hackett Publishing, 2000). Hans Georg Moller, The Philosophy of the Dao De Jing (New York: Columbia University Press, 2008). Bill Porter ("Red Pine"), Finding Them Gone: Visiting the Poets of China's Past (Port Townsend, WA: Copper Canyon Press). Wu Ching-tzu, The Scholars, trans. Gladys Yang (New York: Columbia University Press, 1972). Lu Xun, "Kong Yiji" and "Diary of a Madman" in The Real Story of Ah-Q and Other Tales of China: The Complete Fiction of Lu Xun, trans. Julia Lovell (New York: Penguin, 2009). The first three books are similar in both function and form. Each is comprised of chapters that narrative either the life of key person or course of key event in Chinese history. The Bloodsworths' book is one of my favorite presentations of Chinese history; I am saddened that it is not better known today. The Bloodsworths' focus is on statecraft and strategy. They spend the first eight chapters or so presenting what various Chinese philosophers have said on the topic, and then describe some of the most famous military campaigns and political struggles of Chinese history from the founding of the Han Dynasty to the Communist revolution. In each case they describe what "lessons" are traditionally taken from the events they describe. Willis' book is similar, but his focus is more on culture than combat, with many of his biographies focused on literary figures like Sima Qian, Su Dongpo, and Liang Qichao. Schell and Delury's book returns the focus to politics. However, their book is restricted to the last two centuries of Chinese history. Much like in the West, not every period in Chinese history has had an equal intellectual impact. Philosophically speaking, the foundations of the Chinese tradition were laid in the Warring States and Spring and Autumn era. There were many philosophers who lived then (they were famously called "the hundred schools"), but only seven are must-reads. These are Confucius, Mozi, the Dao De Jing, Mencius, Zhuangzi, Han Feizi, and Xunzi. All except Han Feizi have affordable and complete translations into English (there is a partial translation of the Han Feizi). Ideally you would go read the full translations of each, but for those not this committed Readings in Classical Chinese Philosophy includes excerpts of each. Moller's book on the Dao De Jing is an excellent companion piece: it is short, lucid, and does a better job than any other book I've found at teaching how to read an ancient Chinese text. Ivanhoe's book takes the story forward into the imperial period, providing a very good introduction to "Neo-confucian" philosophy, about which more will be said in the next section. Finally, we get to literature. The most important literary genre in Chinese history is poetry. In imperial times nothing (with the exception of the imperial examination curricula) was more treasured, memorized, or alluded to. Everything paled beside it. In modern China its role has seen relative increase; the average Chinese memorizes reams of poetry before they graduate high school, but most memorize only some of the Mencius. This puts the amateur Sinologist in a bit of a bind: poetry does not translate well. Porter's book is a partial antidote to this problem. The book is partly a biography of a famous Chinese poets, partly a translation of some of their famous poems, and partly a travelogue across modern China. You can use to to identify which Chinese poets are worth deeper investment for you. I do not recommend reading The Scholars all the way through. At least, it need not be read all the way through. Like many of the great Chinese novels, The Scholars is organized as a string of more or less self-contained tales, not unlike episodes on a sit-com. These episodes can be read independent of the rest of the novel. But you may find the novel to your liking: it is a satirical attack on the examination system and contemporary Chinese social mores that reveals a great deal about how Chinese society actually worked during the imperial period. Lu Xun invented modern Chinese literature. I find the two short stories "Diary of a Madman" and "Kong Yiji" referenced more often than any of his other works, but it is worth your time to read the whole thing. Sima Qian, Records of the Grand Historian, 3 vol, trans. Burton Watson (New York: Columbia University Press, 1961). F.W. Mote, Imperial China, 900-1800 (Cambridge: Harvard University Press, 2003). --------------, Mao's Great Famine (London: Bloomsbury Press, 2010). Justin Tiwald and Bryan van Norden, Readings in Later Chinese Philosophy: Han to the 20th Century (New York: Hackett Publishing, 2014). Stephen C. Angle and Jason Tiwald, Neo-Confucianism: A Philosophical Introduction (Cambridge, MA: Polity, 2017). Wu Cheng'en, Journey to the West, 4 vol, rev. ed, translated by Anthony Yu (Chicago: University of Chicago Press, 2012). See also the abridged version. Shi Nai'an, Outlaws of the Marsh, 4 vol, translated by Sydney Shapiro (Beijing: Foreign Language Press, 2001). Cao Xueqin, Story of the Stone (or Dream of the Red Chamber), 5 vol, translated by David Hawkes and John Minton (New York: Penguin, 1973-1982). Luo Guanzhong, Three Kingdoms: A Historical Novel, 2 vol, translated by Robert Moss (Los Angeles: University of California Press, 1991). Mote's Imperial China is one of the best works of history I have ever read. He somehow manages to marry the large-scale macro-historical analysis I mentioned earlier with personal (and often poignant) assessments of Chinese historical figures. I cannot recommend this book enough. Mote has no counterpart for the earlier eras of Chinese history. Sima Qian, the first historian of China and the only great Chinese historian that has been published in an affordable English translation, wrote with a similar sense of scope. The Qin, Han, and Three Kingdom eras are to the Chinese imagination what the Roman Republic and early Empire are to the Western one. Sima Qian covers the first half of all that (the novel Three Kingdoms covers the last fourth). I am treating Dikotter's three histories as one. I would not be surprised if they are included in one volume sometime in the future. I believe they will be the definitive history of the Mao era for decades to come. Gripping, if sometimes sickening, reading. The philosophy selections included in this list focus on Neo-confucianism. The only selections you really need to read in the Readings of Later Chinese Philosophy are the selections from Chinese Buddhist and Neo-confucian philosophy. Neo-confucianism was in large part a response to the Buddhist influx of the middle ages. Confucians felt that the true Confucian way was losing ground to an outside religion. Neo-confucianism was an attempt to create a new Confucian synthesis that not only affirmed traditional Confucian ideals of order, but also equipped Confucians with the ability to combat the sort of metaphysical problems Buddhist philosophy introduced into Chinese thought. The reason this is important enough to justify a place on this list is because it was this new Neo-confucian synthesis that ended up being encoded in the imperial examination system. From the Song Dynasty to the collapse of the Qing, Neo-confucianism was China's reigning orthodoxy. I am not going to say too much about the "four great novels." They deserve their own blog post. I will simply note that for two of the novels, Journey to the West and Outlaws of the Marsh, reading the story all the way through is not strictly necessary. These novels are episodic. Only rarely do the adventures of one cycle impact the plot of the adventures contained in another. This is not true for Three Kingdoms or Dream of the Red Chamber. I do not think either of these novels should be read in an abridged version. Dream of the Red Chamber is the easier to read of the two, but also the more subtle and allusion-filled. Fortunately, you do not need a full command of the Chinese tradition to be captured by this novel's characters. A few parts will be difficult to understand, however, if you don't have a basic grasp on Daoism and Chinese Buddhist thought. Three Kingdoms is a tough cookie to crack. I honestly think it is the most difficult work to approach on this entire list. Explaining why this is so would require an entire essay. All I will say here is that you will have some difficulty with all of the place and character names included in the book. The easiest way to solve this problem is to introduce yourself to these characters and places through a different medium first. There are two separate Three Kingdom TV dramatizations, both of which can be found on Youtube. The Dynasty Warriors video game series is another avenue; the Total Wars franchise will soon release a Three Kingdoms version of its game as well. Finally, there is an entertaining podcast version of the Three Kingdoms tale for those who like that sort of thing. I recommend going with the translations I list above. These recommendations are most forceful for Dream of the Red Chamber and Journey to the West. Trust me: you will have a better experience if you read the Anthony Yu and David Hawkes/John Minford translations of these works. I am less picky with the other great novels. A few caveats about this entire list. It is not comprehensive. I am sure someone will show up in the comments and ask why I have not included The Story of the Western Wing or what have you. My only answer to this is that all lists must end, and this one is long enough already. A more compelling critique is that knowledge of all these classical thinkers and novelists will do you no good in modern China. I sympathize with this. I am reminded of a story David Moser tells about a Chinese woman he met who was writing a PhD on Franz Kafka but had never once in her life heard of Santa Claus. This list will not teach you about the Chinese version of Santa Claus. Nor will it teach you much about the Chinese version of Star Trek, Beyonce, or that meme of the cute toddler making a fist. One could make a good argument that a working knowledge of Jin Yong's Legends of the Condor series will get you further in modern China than a working knowledge of the philosophy of Mozi or Wang Yangming. That is probably correct. But the intent of this list is not to provide you with fodder for impressing Beijing taxi-drivers (I promise you: if you memorize the different provincial capitals and some stereotype about the people from each place, you will impress the Chinese people you meet far more than you ever will by quoting something said by Wang Yangming). The intent of this list is provide you with a foundation for understanding Chinese literature, philosophy, and rhetoric writ-large. To that end this list should be sufficient. See his introduction to “The Great Books of the World: Author-to Author Index.” The Great Ideas Online. No. 692. November 2012. p. 1. See also my earlier post on this topic, "Do Great Books Have a Place in the 21st Century?" David Moser, "Why is Chinese So Damn Hard?" pinyin.info, accessed 23 December 2018. In that way, an explanation would be forthcoming for the future of certain nations which appear to be drawn by an unknown force towards a goal which they are unaware. What Henrich says of neuroscience and economics is true for researchers in the other social sciences. I cannot blame them too harshly. If social scientists tend to view cross-cultural psychology more as a source of trivia than as a source of inspiration, this is partially because the psychologists involved have given political scientists, sociologists, and economists very little to work with. Cross cultural psychologists regularly decry the cultural blindness built into rationalist models of human behavior, but they rarely suggest what a culturally aware model might look like. In many ways the situation reminds me of where behavioral economics stood in the mid 80s and early 90s. Important experiments had shown that homo economicus was more myth than man. Crucial constructs (like “prospect theory”) had been discovered. But these ideas had for the most part not been integrated into working formal models capable of predicting economic behavior in the contexts economists most often studied. If you are not familiar with Schulz's or Rubin’s work, I encourage you to read the full piece. In that column I emphasized conscilience. I had good reasons for doing so: these two lines of research are not nearly as well known as they should be; moreover, I think they can be easily meshed together to tell a compelling story about the rise of modern institutions in Early Modern Europe. That was my approach. My hope is that my piece inspired more people to read the original research I cited. However, when you look at Rubin and Schulz’s work at a more granular level there are key differences in the assumptions each makes about the nature of human interaction. These differences are hard to square. Rubin views human history through the lens of incentives and bargaining. He reduces shifts in culture to shifting incentive structures. Schulz takes a psychologist’s view of cultural change: for him, culture is conceived as an unmalleable set of preferences and behavioral ticks. In his papers the line of causality works in reverse of that championed by Rubin: culture determines incentives. Institutions are reduced to psychometrics. I do not think either approach is correct. Bargaining models of conflict and institutional change that do not incorporate the data produced by thirty years of cross-cultural psychology will always be open to devastating critique from behavioral scientists who are aware of this research. Yet behavioral scientists who equate psychological diversity with specific institutions and political outcomes have side-stepped the most important questions any theory of institution building must face. Neither approach will get to the truth until it takes seriously the methods of the other. Economists like to think in terms of incentives. This book is no different. At every historical turn, it asks the question: Why did the relevant parties act in the manner they did? The answer given in this book always boils down to: “They were incentivized to act in that manner.” Incentives come from a host of societal attributes: politics, religion, social norms, laws, and culture are just a few. The inquiry cannot stop there: simply noting the incentives that individuals face is the last step. It is critical to take a step back and ask: Why were those incentives there in the first place? Why do the incen- tives people face differ in different places and at different times, and why do they change over time? Why do they sometimes not change over time? A simple economic example illustrates the problem with arguments relying on “inherent conservatism.” Consider the fact that elderly individuals are less likely to use computing technologies than teenagers are. On the surface, it may seem like older people are inherently more conservative – they prefer sticking with writing letters over sending e- mails. This, however, is a too simplistic argument. Older people are less likely to use advanced computing, not because they prefer the old ways more than teenagers do, but because the costs and benefits of learning a new technology are different. It may in fact be less costly in terms. Instead, the incentive structure is such that the elderly have less incentive to learn new technologies. This book applies a similar logic to economic history. Chapter 2 provides a framework based on the incentives the relevant players face in the bargain over laws and policies. It shows the conditions that incentivize these players to choose laws and policies that respond to changing economic environments. “Conservative” outcomes result when these conditions are not present, in that laws and policies do not change in spite of a changing world. But these are outcomes, not preferences. This book does not rely on some ad hoc theory of a “conservative nature” of certain groups of people; instead, it shows why certain people act conservatively. In the context of the Middle East–Western Europe divergence, an implication of this way of thinking is that conservatism is an outcome to be explained – it is not itself a cause of stagnation. While there is indeed evidence suggesting that Islamic political and religious thought became more conservative starting sometime around the turn of the first millennium, this does not mean that we should take the false path connecting a conservative outlook to economic stagnation. Instead, the correct questions to ask are why some cultures are more conservative than others and were there incentives in the Middle East which eventual y led to conservative outcomes. A deeper answer requires that we look beyond cultural differences and analyze the key drivers of incentives, be they economic, religious, social, or political. So that is Rubin’s theory–conservatism is mostly a matter of the incentives faced by political actors. If the incentives change, so would their traditional attitudes. This view has a problem. It contradicts what we know about the nature of political ideology and political preferences. Sixty years of research conducted by social and political psychologists is clear on this point: political attitudes are to a significant extent the product of dispositions. These dispositions are not plastic. Behavioral scientists have successfully linked political dispositions to personality types (e.g. the Big 5), preferences only tangentially related to the political realm (e.g. disgust sensitivity), and behavioral or perceptual quirks unrelated to ideology (e.g. the messiness of one’s room or the speed of threat perception). FMRI studies have linked many of these differences in political behavior to differences in brain structure. Twin studies suggest that somewhere between 40-60% of the variation in a given population’s political preferences can be attributed to genetics; other studies show that most political attitudes are locked in early in life, unduly influenced by the political and economic events that occur during subjects’ teenage years. Schulz et. 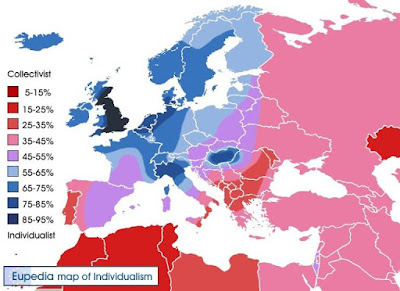 al’s study contains an interesting example of the ‘stickiness’ of these dispositions: their data does not just correlate WEIRD psychological traits with kin practices of a given society, but also the psychological traits of 2nd-generation immigrants whose parents who grew up in countries whose kin institutions differ from those they’ve experienced their entire life. Incentives cannot account for their attitudes. If economic and political attitudes were truly a matter of local economic incentives, we would expect these children to have attitudes that mirrored that of the society they grew up in, not that of their parents. This is not what is happening. Table 4 in Schultz et. al, "The Origins of WIERD Psychology,” p. 21. The literature on political dispositions is not without its own flaws. (In particular, personality and biological theories of political preferences, most of which are based purely on cross-sectional data, have a difficult time accounting for shifts in preferences over the long term. Cohort based theories do a bit better here). But the central point stands: the “traditionalism” or “conservatism” of a given political actor is only partially the result of explicit calculation on their part. Incentives are inflected through dispositions. These dispositions are “sticky,” changing far less and far slower than any rationalist, incentives-based account can justify. Schulz’s work comes from a research tradition that take variation in psychological traits very seriously. He works now as a post-doc with Joseph Henrich, one of the first experimenters to test whether individuals from non-market economies acted the same way as neoclassical economics predicted they would. The now commonly used acronym “WEIRD” (“Western, Educated, Industrialized, Rich, and Developed”) was invented in a co-paper Henrich authored. There probably is no research center north of Michelle Gelfend’s SDOS Culture Lab that studies the economic consequences of cross-cultural variation more vigorously than his. Experimental data is the empirical foundation of this literature. Schulz’s work here is no different. His claims reduce to an extremely fine-grained set of correlations between observed variation of psychological traits in modern populations and the geography of medieval Catholicism. Yet when it comes to the study of political and economic institutions, experimental data can only get you so far. The theory that the collapse of cousin-marriage in Medieval Western Europe is responsible for modern Western European’s neighborly, pro-social conception of civic life is not new. Versions of it have been floating around the Internet for some years now. (The earliest version I can find is a 2003 article in the American Conservative by Stever Sailer; none are cited by Schulz or his co-authors in his papers). The advantage Schulz’s work has over these earlier Internet debates is data: Schulz tests his theory with a remarkable set of different data streams, finding significant correlations between cousin marriage and WEIRD psychology at the global level, within Europe, within individual countries, and in immigrant groups that have moved away from their country of origin. But his argument has a problem. It is all correlation and no causation. Schulz has identified a plausible mechanism for the origin of Western psychological norms. What he has not identified is a mechanism that connects these norms to the origins of the political and economic institutions that set Western Europe on its unique historical trajectory. The path from WEIRD psychology to WEIRD institutions is treated as an automatic given. I suppose this is an oversight made for our age. One way to see Schulz’s work is as a necessary corrective to our recent history. Out of the Cold War’s ashes came a species of triumphalism that assumed democracy and free markets would thrive wherever Western institutions could be imposed. Imposed they were. In the disastrous after-math of premature democratic expansion, Westerners made a sad discovery: Neither sword nor purse-strings can construct a functioning democracy. The letter of the law matters less than the spirit of those who enforce it. Foisting new institutions upon a people is easy; fostering the cultural traits necessary for institutional success is much harder. Schulz’s theory shows why this might be so. What Schulz’s theory can not show is where these institutions came from in the first place. The WEIRD psychological suite may be a necessary precursor to WEIRD political and economic institutions; it is not, by itself, a sufficient explanation for these institutions' emergence. The central problem is the WEIRDos of European history were not working with a blank slate. The burghers of Europe did not gather together to design a system of government best suited to their psychological profile. If the form of government they eventually attained offered them unusual power in political affairs, it is because their ancestors seized this power from the kings of Europe. The history of inclusive economic and political institutions is a history of conflict and bargaining. Inclusive institutions were incremental, ad-hoc creations, developed mostly (though not entirely) as cities, counties, and aristocrats tried to resist the demands of war taxes and levees. This process was apparent to thoughtful British historians two centuries ago, and has been confirmed by the research of contemporary historians, political scientists, and sociologists. Political life in Western Europe was a constant battle between the ruler and the ruled. The former needed cash; the latter did not want to give any. To secure the resources they needed, monarchs often were forced into making concessions to the nobility, the burghers, or on rare occasions, the peasantry. These concessions often involved limiting the powers of the Throne. At other times they meant sharing control of policy or taxation with estates the monarch would have otherwise preferred to ignore. It is through such concessions representative government was born. One of the central puzzles facing anyone who surveys this history is nailing down a theory for why bargaining lead to inclusive reforms in some places (England, Holland, etc.) but did not lead to these reforms in others (Russia, China, and so forth). The models sociologists, political scientists, and economists have developed to answer this question can be quite sophisticated. Different models have keyed in on different points: for some it is the type of geopolitical threats a society faced, for others the size or nature of the wealth that monarchs hoped to extract, for yet others it is the form of the original political regime or system of landholding that mattered most. But each of these theories follows a pattern. It isolates a variable that might give citizens an advantage when bargaining with the Throne, and then models how this advantage might change the outcomes and incentives each side faced. There is a role here for the data Schulz and company have amassed. Schulz has demonstrated that cross-cultural psychological variation is real. He also has shown that the trusting, pro-social norms that dominates Western European psychology today were in place by the beginning of the Early Modern Age. In light of what I wrote above, this leads to an interesting question: does WEIRDness give an advantage to subjects bargaining with a monarch? If so, how could that advantage be modeled? I suspect that one way to approach this is through the lens of collective action. In the footnotes of a paper that presents their favored ruler-vs.-ruled bargaining model, political scientists William Roberts Clark, Matt Golder and Sona Golder admit that the least realistic thing about their model is its failure to account for the difficulty the ruled have coordinating a response to the ruler’s decisions. This is a good starting point. I find it plausible that a population of neighborly, rules-lawyering subjects will have an easier time overcoming the problems of collective action than a population with a different psychological profile might. I am very interested in seeing a formal model that demonstrates how the pay-offs might change as the coordination costs of collective bargaining shift. If these costs can be tied to the psychological variation that Schulz has uncovered, a convincing theory of European institution-building will have been found. This sketch should give you an idea of my answer to the questions that opened this piece. These musings are still only half thought-out, but they are based on a real conviction: cross cultural psychology has the potential to transform our understanding of human history. Both the pay-offs and the inputs in the models we build can and should be informed by psychological research. That is the dream. Hopefully we will soon see the day when behavioral scientists take bargaining theories of social conflict seriously, and social scientists are willing to treat the the data gleaned from cross cultural experiments as a central component of their formal models. For some key summaries, see Richard Nisbett, The Geography of Thought: How Asians and Westerners Think Differently… and Why (New York: Free Press, 2003); Joseph Henrich, Steven J. Heine, and Ara Norenzayan, “The Weirdest People in the World?” Behavioral and Brain Sciences 33, no. 2 (2010): 1–75; Michelle Gelfand, Rule Makers, Rule Breakers: How Tight and Loose Cultures Wire Our World (New York: Scribner, 2018). Tanner Greer, “How the Catholic Church Created Our Liberal World,” The American Conservative (17 December 2018). Jared Rubin, Rulers, Religion, and Riches: Why the West Got Rich and the Middle East Did Not (Cambridge: Cambridge University Press, 2017), kindle locations 530-573. For a survey of these studies, see Gian Vittorio Caprara and Michael Vecchione, “Personality Approaches to Political Behavior,” David O. Sears and Christia Brown, “Childhood and Adult Political Development,” Carolyn Funk, “Genetic Foundations of Political Behavior”, and Stanley Feldman, “Political Ideology,” in Leone Huddy, David Sears, and Jack S. Livy, eds., Oxford Handbook of Political Psychology, 2nd ed. (Oxford: Oxford University Press, 2013), 23-96, 237-262, 591-627; Brad Verhulst, Lindon Eaves, and Pete Hatemi, “Correlation not causation: The relationship between personality traits and political ideologies,” American Journal of Political Science 56 (2012), 34–51; Carolyn L. Funk, et. al, “Genetic and Environmental Transmission of Political Orientations,” Political Psychology, 34 (2013): 805-819 ; John T Jost et al., “Political Neuroscience: The Beginning of a Beautiful Friendship,” Advances in Political Psychology 35 (2014): 3–42. Schulz, et. al., “The Origins of WIERD Psychology,” pp. 20-21. See Grief, "The fundamental problem of exchange: A research agenda in Historical Institutional AnalysisEuropean Review of Economic History, 4, 251-284. Incidentally, Grief's paper "Cultural Beliefs and the Organization of Society: A Historical and Theoretical Reflection on Collectivist and Individualist Societies" anticipates much of what is about to follow. For a light and popular history of Western civilization framed through this idea see John Ferejohn and Frances Rosenbluth, Forged Through Fire: War, Peace, and the Democratic Bargain (Liverlight, 2016). The allusion is to Macaulay. For the modern assessment on English history: John Brewer, The Sinews of Power: War, Money and the English State, 1688-1783 (Harvard: Harvard University Press, 1990); Douglass North and Barry Weingast, “Constitutions and Commitment: The Evolution of Institutions Governing Public Choice in Seventeenth Century England”, Journal of Economic History 49 no.4 (1988), 803-832. For examples of theories that focus on the nature of the geopolitical threat: Yuhua Wang and Mark Dincecco, “Violent Conflict and Political Development Over the Long Run: China Versus Europe,” Annual Review of Political Science 21 (2018), 341-358. For examples of theories that focus on changes in the scale or type of wealth: William Roberts Clark, Matt Golder and Sona N. Golder, “An Exit, Voice and Loyalty Model of Politics,” British Journal of Politics 47, iss 4 (2017), 719-748; Carles Boix, Political Order and Inequality (Cambridge: Cambridge University Press, 2015). For examples of theories that focus on pre-existing legal and political regimes: Charles Tilly, Coercion, Capital and European States, AD 990-1990, (Cambridge: Basil Blackwell, 1990); Thomas Ertman, Birth of the Leviathan: Building States and Regimes in Medieval and Early Modern Europe Birth of the Leviathan: Building States and Regimes in Medieval and Early Modern Europe (Cambridge: Cambridge University Press, 1997). Clark, Golder, and Golder, “An Exit, Voice, and Loyalty Model of Politics,” note 16. “You’re ten years younger than I am, Dacha, and so the Master means more to you. We of the old guard, we were trained to depend upon ourselves, we had no use for masters, except those anointed by trust. But to the snot-nose brats of the next generation, intoxicated by the loudspeakers, no doubt he seemed a kind of god. Those youngsters will only sober up inside the grave he’s digging for them, or on the very edge of it, like us for that matter. I met him twenty years ago. There was no genius about him, there was no more to him than to any of us — something less, in fact. I have a new essay out in Foreign Policy this week. The editors gave it the clever title "One Belt, One Road, One Big Mistake." In it I argue that the Belt and Road Initiative has been something of a financial and strategic disaster for the Communist Party of China. Those who want the United States and its allies to compete with Beijing by splurging on infrastructure in the BRI mode are asking us to follow the fool in his folly. The expansion of the Belt and Road Initiative across the globe is deeply worrisome not because of the strategic threat it poses to the standing international order, but because of what it tells us about the internal workings of the world’s most powerful authoritarian state. These problems are not new. For the last three years even China’s state-run banks have been trying to extricate themselves from spending more on the initiative. Yet despite these problems, the initiative expands to new countries and continents. Why this is happening is clear enough—no other foreign policy program is associated personally with Xi like this one is. Xi’s apotheosis to permanent leadership at the 19th Party Congress this spring meant that his signature foreign-policy initiative also had to be elevated—and so it was, written directly into the constitution of the Chinese Communist Party. Now to attack the Belt and Road Initiative is to attack the legitimacy of the party itself. The Belt and Road Initiative is evidence that the party’s once responsive policymaking system is breaking down. The rest of the world must recognize that BRI persists only because it is the favored brainchild of an authoritarian leader living in an echo chamber. I have heard the suggestion that President Trump is a man who surrounds himself with sycophants. I have not seen much evidence this is true. If it is true, then White House sycophancy has had little effect on policy. This makes sense: Trump is neither a wonk nor an ideologue. He is not the sort of person to conflate a policy plank with his person. There simply is no benefit to toadying up to the President's pet policy. He has none. This has its benefits: this administration has largely escaped the mire of groupthink. Trump prefers loyalty and competence over ideological fervor. If Trump's politics in office have been mercurial, this likely has more to do with the fact that his team is divided by genuine policy splits than with quirks in the Presidential personality. Factional infighting has its dangers. But when the American and Chinese teams meet together at the negotiating table, it is not the American side that unsettles me. I am far more worried about what is going on in Beijing. Something on the Chinese side is broken. Effective statesmanship is difficult when statesmen cannot get an accurate read of how things are playing out on the ground. I fear Party leaders are not getting an accurate read on anything. The BRI mess points to an OODA loop that is mangled and malfunctioning. The trade war is another symptom of the Party's inner crisis. The most spectacular thing about the trade war is how surprised the Party was that it happened at all. Zhongnanhai was caught flat footed by a conflict whose contours were clear months before the first shots were fired. They have needlessly bumbled and stumbled since, handing gifts to their rivals in Washington that need not have been given. The trade war ads placed in the Des Moines Register back in September are the perfect example. The advertisements targeted a President known for personalizing even tepid attacks on his program, were oblivious to a media landscape that had long defined election interference as the most explosive issue in American politics, and were published just after the administration's China skeptics were signalling they had finally devised a strategy to counter rising Chinese influence. Everything about these advertisements betray terrible judgement. This was obvious before they were published. Anyone who understood just an inkling about American political culture would have known how foolish it was to go ahead with that ad campaign. It still happened. In the Communist Party of China there is a disconnect between the people who have the power to shape events on the ground and the people who understand how things actually stand on the ground. This disconnect has many sources: the obvious one, which I focus on in the column, is the deification of Xi Jinping. 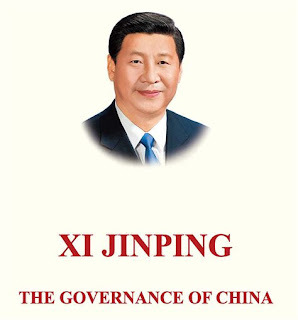 General Secretary Xi's rise to godhood means that criticism of his policies (especially the policies upgraded to the label "Xi Jinping Thought") is equated with betrayal of the Party itself. Xi's great anti-corruption campaign is another likely culprit. Anti-corruption means no flamboyant expenses; no flamboyant expenses means fewer government salaried academics, think tankers, and officials traveling to places like the United States. Anti-corruption also means fear. Hundreds of thousands of officials have been jailed or sacked. In an environment where everyone's job is on the line, there is little incentive to be the bold truth teller in the room. To succeed in today's Party, you keep your head down. This has consequences. I do not mind if the Party leadership miscalculates on the economic front; the more reasons they give western firms to get out of China, the better shape we are in. My worries lie in the military domain. The People's Liberation Army has been ruthlessly gutted by Xi's campaigns. Were Secretary Xi to overestimate the capabilities of the armed forces under his command, which PLA leader is in a position to talk him back to reality? Things did not turn out well for the last general who tried to tell hard truths to the Party's 'core leader.' May the next general to attempt this feat secure a happier fate than he. Tanner Greer, "One Belt, One Road, One Big Mistake," Foreign Policy (6 December 2018).